Asia Automatic Pump Co.,Ltd was established in 1969,located in Kaohsiung city, Taiwan, and also created its brand name “EVERGUSH”. 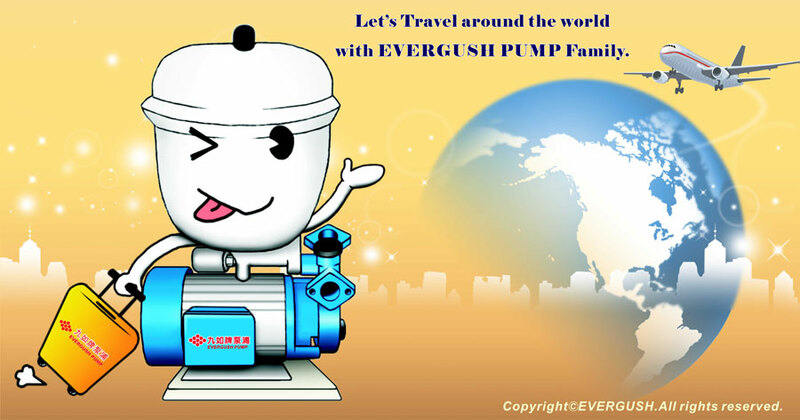 EVERGUSH is the pioneer to produce the first domestic auto booster pump, fire-fighting pump, and inverter controlled booster pump set in Taiwan. In past 50 years,EVERGUSH is devoted to manufacturing and developing all kinds of water pumps, such as domestic pumps, centrifugal pumps, submersible waste water pumps, industrial and commercial pumps, deep well pumps, SUS multistage centrifugal pumps, inverter controlled pumps, fire-fighting pumps, water pumps for agriculture and aqua farm, ..etc. More than 50 series of pumps, over 4,000 different specifications,and continued to increase. In 2009, EVERGUSH started to develop all kinds of control panels for water pumps and completed control panel assembly line.In 2013, EVERGUSH established assembly line of diesel engine generator set and began selling. In June/2015, EVERGUSH successfully applied "Diesel engine Genset TAF LAB Certification. Nowadays,EVERGUSH owns 6branch offices,4 sub-plants in Taiwan.For the Global market, EVERGUSH is present over 40 countries, such as Japan,South Korea,China, South East Asia Countries, India, Central and South America ,Australia ,New Zealand, Iceland,Switzerland, Middle East,..etc. EVERGUSH New Headquarters, located in Kaohsiung (Taiwan), expected to be completed by the end of 2018. Expanding to 16,500 square meters area. Expanding Automatic production line and testing & QC devices. Applying for Electric motor TAF Lab. certification. Applying for Water pump TAF Lab. certification. Applying for Diesel engine Generator TAF Lab. certification. Enthusiasm, dedication, innovation, quality, and perseverance are the tenets that we have adhered to in the past 50 years. We will do our best in products, quality and good after-sales service, and let users who use EVERGUSH pumps and generators. Have no worries and enjoy the joy of water and electricity. Asia Automatic Pump Co.,Ltd(EVERGUSH PUMP/GENSET) is the first one and the only one Pump&Genset manufacturer that owns TAF(ILAC-MRA) Certificate for Pumps/Gensets/Electric Motors in Taiwan. Remark 1: CNS: Chinese Standard ; CFS: Chinese Fire protection Safety ; TTQS: Certificate of Talent Quality Management System. Remark 2: ILAC- International Laboratory Accreditation Cooperation ; MRA-Mutual Recognition Arrangement. http://ilac.org/ (Please link to ilac official web-page). In response to the government's environmental protection and new energy policies, our new factory built a scaffold-mounted solar power system on rooftop with a total capacity of 260.4 kWp. It can produce more than 320,000 kWh of clean energy a year, close to the factory's need for self-sufficient power. Each year, about 200 tons of carbon emissions can be reduced, which is equivalent to 0.7 annual intake of carbon in Daan Forest Park(Taipei/Taiwan). It can effectively reduce indoor temperature of the building and reduce the use of air-conditioning. In addition, turf grass is planted on the rooftop, greening the environment and promoting environmental sustainability. Evergush's entrepreneurial spirit: Enthusiasm for the work and service, Travel around the world, and Enrich Life.